Mather offers loads of natural remedies for the symptoms of measles. Above all, he is against the “pernicious Method of Over-doing and Over-heating, and giving things to force Nature out of its own orderly way of proceeding. Before we go any further, let this Advice for the Sick, be principally attended to; Don’t kill ’em! That is to say, with mischevous Kindness. Indeed, if we stopt here and said no more, this were enough to save more Lives, than our Wars have destroy’d,” 1. 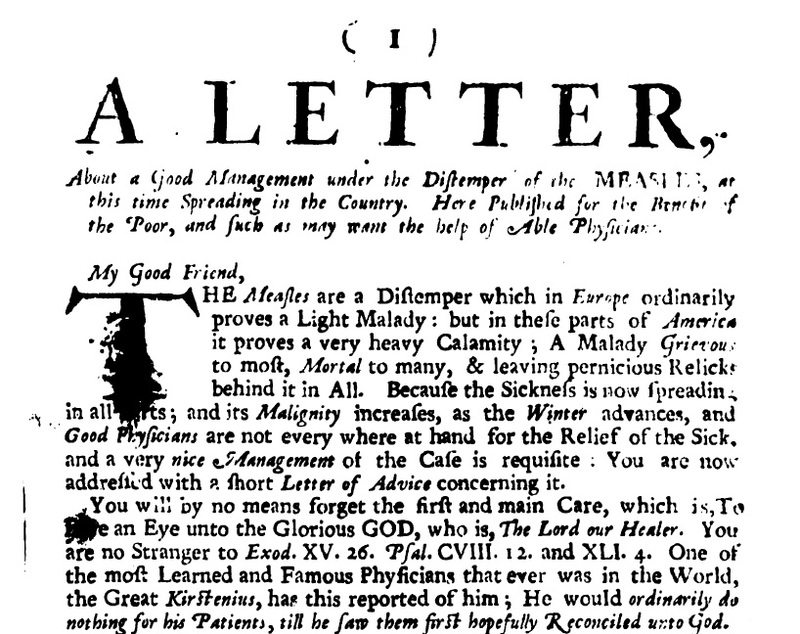 Mather doesn’t address the prospect of blindness or death, although on page 1 he warns that all patients should of course be “first hopefully Reconciled unto God.” I guess that’s the best that some of our fellow citizens can hope for in the midst of this needless, stupid, and utterly preventable outbreak. Maybe we historians need to tell some of these stories so that people realize that these so-called “childhood diseases” can maim, kill, or shorten a life. I am the granddaughter of a man I never knew, because he died at age 38 from heart valve damage caused by a childhood bout with rheumatic fever. He left a widow alone to raise their 9- and 7-year old daughters. Had he lived in the age of antibiotics, he would probably have lived to a very ripe old age. These modern anti-vaxxers probably make promiscuous use of antibiotics when their children need them. So why the hostility to vaccination, which is even safer and more benign than a course of antibiotics? They are scary people. And I feel very sorry for their kids. Well, actually that’s just the liberal ones currently in the media who get their medical advice from Jenny McCarthy. I have no idea what the conservative ones are like, but I assume they’re scary in different ways. As part of the last generation to actually *get* measles, it was (a) uncomfortable and (b) potentially dangerous. And it was very clear that it was dangerous, particularly for adults who had not had it as a child. And back in the day, my school quarantined us, so there was a week or two between when my sister caught measles, and therefore exposed me, and when I got it. And I couldn’t go to school. So there are more mundane consequences for families. As for the 18th c advice, the link to smallpox is interesting, though measles was not usually thought to be as disfiguring, I think. And if you have nothing you can really do, nature is your friend. OMFG the blue children post was priceless, Nicoleandmaggie! Yikes. I should have figured. But the point stands: I can’t fathom people who won’t avail themselves of proven drug and vaccine interventions. My family’s history was immediately affected by premodern medicine in living memory. “Nature” and “Natural” are still widely invoked today, with the widespread belief that anything found in nature is good and anything that needs to be manufactured by human technology is suspect. For example, when people worry about chemicals, they are worried about chemicals that are not found in nature. These beliefs are justified in some cases – chemicals that the body has not evolved to deal with can sometimes cause negative effects, and the companies that make chemicals often can’t be trusted to be honest and open about potential dangers – but in other cases these beliefs are simply paranoia based in a false belief that natural = good. Nature is full of things that are bad for you, and there are plenty of “unnatural” things that are good for you – like vaccinations and antibiotics. Ironically, another thing that has fueled anti-vaccination and other anti-mainstream medicine beliefs is their very success. People who grew up in a world mostly free of many of the worst childhood diseases do not realize how terrible they were, and how great an accomplishment it was to mostly eliminate them. Instead, they fear things that are either real, but rare, or entirely fictional. Years ago (mid-90s?) I read a worldwide study on vaccination attitudes. There was near 100% support for all vaccines in, e.g., uneducated Bangladesh. The lowest was among highly educated coastals in the US. The authors had expected the opposite result. The Hindus have a saying: death is a great teacher. I live in one of those areas where anti-vaxxers have dropped us below herd immunity levels for measles. It’s been kind of funny to watch the comment sections in the LATimes do a full 180° turn. Articles on the topic used to be flooded with the anti-vaxxers. Now they’ve vanished and it’s all people upset that their newborns (measles vaccine is usually given at about 12-18 months) should be endangered by selfish idiots. It’s obviously an important question, but on a personal level, I have to say I’m just totally goddamn motherfucken sicke and tired of trying to figure out the fucken fucked uppe mental mechanisms underlying the twisted degenerate thought processes of fucked uppe destructive assholes. 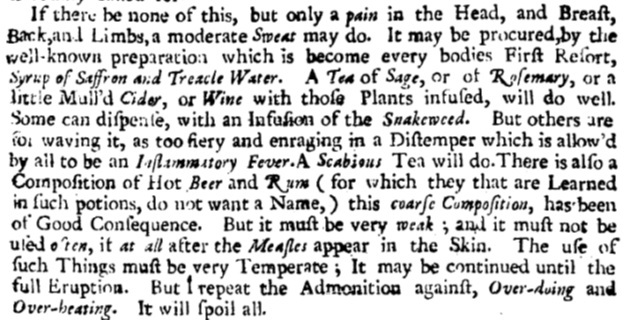 I find that the disease was apparently considered pun-able in the late 18th Century. In 1778 a Continental Army general railed that he had buried “some hundreds” of his men that winter, who had died, he said, “of a disorder called the Meases,” invoking and misspelling the name of a hapless military bureaucrat who he blamed for not providing enough winter clothing for the soldiers under his command. They did a lot of inoculating that year, but for smallpox, so I guess no cross-benefits between those two diseases. I had the odd experience of being vaccinated for the measles and then getting them anyway soon after (not an effect of the vaccine; probably a bad or badly handled batch of vaccine, since my brother, vaccinated at the same time, had the same experience). The anxiety level about them at the time seemed to be relatively low (probably in part because the vaccination rate in our community and school was very high) and neither of us got all that sick (I did get quite sick from the chicken pox, for which there was no vaccination available, but I had them fairly late, in early adolescence). So I’m finding some of the “the measles are deadly!” stories a bit overblown (especially when they give numbers of deaths without percentages), even as I, too, am at a loss to understand why anybody, especially anybody highly educated with the means to get good health care, would choose not to vaccinate their children. My parents certainly had no hesitation. I can’t help wondering whether their memory of polio, which was still a very real danger in their childhoods, played a role in that willingness (and whether the lack of immediate memory of deaths or longterm disability due to now vaccine-preventable illnesses plays a role in the current anti-vax nuttiness). My mother was always careful to explain to us why “shots” were necessary, and memories of polio and the limitations it imposed (e.g. closed swimming pools) figured large in those explanations. So did the idea that we were helping to protect others (e.g. pregnant women whose babies might be harmed by their getting the measles; that seemed to be the main danger of the measles of which she was aware, or at least that she was willing to share with us). And, of course, my experience is another good reason to vaccinate: if there had been no measles at all circulating in my area, I wouldn’t have gotten them, vaccine failure or no. I think the absence of living memory of polio is a big part of the rise of the anti-vaxers. The age of the vast majority of new parents these days is AT MOST the mid-40s, which at this point means people born in the very late 1960s and beyond, so a nearly at least a full generation past any memory of polio or measles outbreaks. I also lament the absence of civic responsibility in my generation, at least among affluent parents. It’s interesting where we put our energies as a culture regarding purity and the perception of pollution/danger. Littering used to be a major issue–remember the iconic crying Indian commercial? We’ve done so well in terms of reducing littering & encouraging recycling since the 1960s and other measures of public well-being. Why can’t people connect the dots to understanding the importance of vaccination? Instead, as an article today in the LA Times suggests, the anti-vaxers are digging in deeper and insisting on the righteousness of their cause. This is also a natural consequence of the privitization of American life. When we make parents solely responsible for paying for a child’s health care, as we have, then it’s harder to convince these privatized parents that they owe anything at all to the larger public health system. I’ve thought about this a great deal when it comes to parents who get an awful diagnosis for a fetus in utero, mostly around the issue of abortion & my belief that the government can’t morally coerce women into carrying a child to term when all of the work and expense of care for the child will devolve onto the parents. But I think these issues are certainly linked: when parents are the only ones holding the bag, I can understand to some extent their insistence on the importance of their (imagined, internet-fueled) “authority” on vaccinces. We had enough immigrants in our school system that I went to middle school and high school with a girl who had had polio as a child. That’s definitely the sort of thing that sticks in one’s memory, especially knowing that if she’d been in the US instead of Mexico, that never would have happened to her. From a private email from a reader–trigger warning! Humorous mockery of natural parenting if you click here. My great-uncle had polio as a child. He walked with two canes because his spine was twisted. Still had a great life, but I’m sure he would rather have had a vaccine. The other thing about invoking ‘nature’ is that nature is a huge, overwhelmingly powerful force. You don’t want to go up against nature; much better to align yourself with it and have that powerful force working for you. So presenting one’s preferred approach as ‘the way of nature’ helps establish it as an *effective* approach. Or inevitable, even? Good point. Let’s see: pre-1965, there were “hard” measles, which could make you delirious with fever so that you heard voices; scarlatina or scarlet fever, which could send you to the hospital; German measles; mumps; chicken pox. Smallpox vaccinations, mandatory, which no one said no to. Polio vaccines, in shot form, which everyone was grateful for. TB tests. And some parents would do away with exposing their children to some of these because Indigo Moonbeam on some lunatic website says science is just a matter of belief? In Mark Twain’s _The Mysterious Stranger_, one of the episodes, just casually mentioned, is of someone who gets measles and ends up with no sight or hearing. Just your basic everyday occurrence, in the story. I usually try to be more moderate than this, but this attitude makes me furious. There is an interesting interview in the LA Times today with Elena Conis, an Emory U. historian who’s written about the history of vaccines & public acceptance or resistance thereto. She takes a very understanding view–perhaps too understanding–of the anti-vaxxers. She doesn’t like that term, and she urges understanding parental fears of an increasingly long and complicated vaccine schedule. As you point out, Undine, the list of “mandatory” vaccines has increased in the past 30 years. The interview is worth a read–she offers an interesting longer-term context on fears of vaccination. However, it’s one thing to understand those fears, and it’s another thing to benignly tolerate or even encourage them. The fact of the matter is that the anti-vaxxers (I like that term myself) are reluctant to self-identify these days in SoCA because of the measles outbreak here. And we know that social opprobrium has worked to curtail all kinds of dangerous and anti-social behavior, from smoking to littering to drunk driving. I think that might work if vaccinating parents started demanding that their children’s friends and classmates were vaccinated, in tandem with some mockery and sarcasm about their unsupported beliefs. Why shouldn’t anti-vaxxers be compared to drunk drivers? The problem isn’t you getting drunk or even driving around on your own property–go ahead and drive drunk at home all you like. The problem is that you insist on driving on public roads while drunk, thus endangering others. Also, let me just say that I don’t get it why parents of perfectly healthy children won’t vaccinate on behalf of those too young, too sick, or too immunocompromised to get vaccinated themselves. That’s as anti-social as drunk driving. I guess they never had anyone in their lives who had compromised immunity, or know of any infants who are too young to get the vaccines yet. Nice “civil society” we’ve got here. Shame if anything happened to it. Jeez. If you hang out on mommy fora long enough, you see those waves happening. There’s a small core of crazy ladies and a sizable group of women who are easily led by strong personalities. Whenever there’s an outbreak, pro-vaxers with strong personalities start posting, and that easily led group of women takes their kids to the pediatrician’s office for vaccines. Especially if someone knows someone who got measles or whooping cough or what have you. The opposite happens on the fora whenever a kid has a negative reaction to a vaccine (which does happen occasionally… some kids get allergic reactions or swelling at the site). The easily led folks decide to wait on vaccines. It’s all availability heuristic for a lot of folks. What I don’t get is the militantness of the anti-vaxxers. It would make so much more sense if they just didn’t vaccinate and told everybody else to vaccinate so their kids could be both unvaccinated and benefiting from herd immunity. They should be trying to convince everybody else to vaccinate or at least keep their mouths shut. N&M, thanks for reading the mommy blogs & keeping us informed so I don’t have to! And who knows what people *actually* do with their families, as opposed to what they say they’re doing online. Those weak personalities you describe may be so indecisive that they don’t take action. They may just tell the loudest people in a forum what they want to hear. Well, I’m not on the mommy fora anymore. But I was on one in SoCal during a previous out-break. I don’t know what people actually do, there were names of pediatricians (there are only a few pedis who are recommended by the crackpots) and reports from annual check-ups being thrown around. And you could definitely see sea-changes in the way people were talking, and people in LA seem to be especially into knowing what other people are doing and following fads compared to other places I’ve lived. My father’s primary memories of his childhood in the 1920s and 1930s are of being quarantined, repeatedly, as he worked through most of the diseases Undine listed. Hmmm…maybe because drunk drivers don’t freeride on the herd immunity the rest of us create? That’s not really helpful to the anti-vaxxers’ cause, is it?